The shimmering crystal of Aquamarine ranges in color from graceful sky blue to deep navy blue. Its beautiful color have been adorned by women. For many centuries, the greatest jewelry designers have been inspired by this gem. 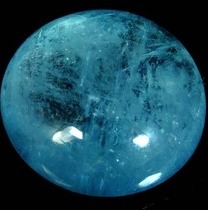 Aquamarine is closely related to Emerald. In fact, they both belong to the Beryl family. The Gem of March which has always symbolized loyalty and friendship, seems to have really captured the shining blue of the ocean, and makes our minds to recall the fabulous images of the sirens. Without doubt its name derives from the Latin words: Aqua and Mare. The various colors of Aquamarine have got melodious names, but there is one that stands out above all the rest: Santa Maria Aquamarine of rare deep blue color. Santa Maria comes from the homonymous mine of Santa Maria Itabira, located in Brazil, where the first of these Gemstones was discovered om the 1950s. 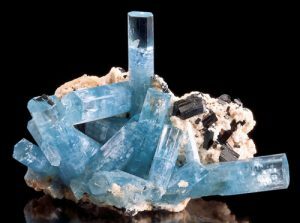 The legendary Santa Maria Aquamarine can also be found in some mines in Mozambique, and to distinguish it from the Brazilian variety, it is called Santa Maria Africana. Espirito Santo is a trade name for the Aquamarine of not very deep blue color, which comes from the homonymous Brazilian state. 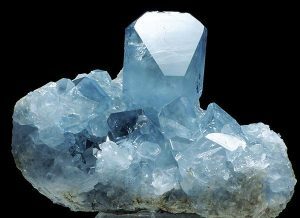 Martha Rocha Aquamarine which has been named after a Brazilian beauty queen, also displays a unique blue colour. The world leaders in the production of this magnificent variety of Beryl are Brazil, Pakistan and China. Brazil is the most important source of Aquamarines. The first discoveries are dating back to the beginning of the 1800s, when a crystal weighing 110 kg was emerged from the river bed in Teofilo Otoni area, in Minas Gerais. Since that time, millions of carats of Aquamarines have been mined in the thousands of Brazilian mines. The Germans who immigrated to Brazil around 1850, used to find those crystals everywhere. They dug them manually with any sort of tool, and sent the specimens to Idar Oberstein. Thus, a century-long business relationship was established between the two nations. 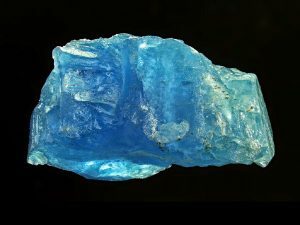 Usually, the Aquamarines have been found in the river beds, but many independent miners, called Garimpeiros, had excavated them from the earth’s crust until the government took action to stop it. This amazing Gemstone has always been the highlight of the necklace. Beautiful Aquamarine pendants are always among best-selling items on the modern market. The gemstone can be of any size or shape, and can be mounted either in a prong setting or in a bezel setting.